- Use a USB flash drive or a memory card -- microSD, microSDHC, or micro SDXC cards all work with Surface. 1. Open the Settings charm, tap or click Change PC settings. 2. Tap or click General. Scroll down to Available storage, to see how much storage space you have. Or don't move files to Surface. Store them in the cloud instead using Your files on SkyDrive. This way you can access your files from other computers or your phone. Surface can access music, pictures, videos, and documents on computers that are part of your home network. To see the files and folders that have been shared on your network, go to the Start screen and open File Explorer. Shared items appear under HomeGroup or Network. You can also move files to Surface, by copying them to a USB flash drive or memory card (microSD, microSDHC, or micro SDXC cards all work with Surface) and then adding the files to Surface. 1. Copy files onto a USB flash drive or memory card on your other computer. 2. Insert the USB flash drive or memory card into Surface. 3. Tap or click the notification that appears in the upper-right corner of the screen. 4. Tap or click Open folder to view files. 5. Select the files or folders you want to add to Surface, tap or click Home, and then tap or click Copy to. 6. Select a location. For example, choose Documents if the flash drive or memory card contains documents. With SkyDrive, you can store music, pictures, and documents in the cloud and access them from any web-connected device. This includes your Surface, phone, or any computer. To learn more see SkyDrive or help within the SkyDrive app (open the Settings charm, and then tap Help). - You need to have a Microsoft account associated with your user account to use SkyDrive. - By default, Microsoft Office Home & Student 2013 RT Preview saves documents to SkyDrive. - Better Put Surface Tablet friendly videos to the device. If you've got the Surface Tablet specs, you will know that Kindle Fire HD video format is limited. Thus, if you want to copy and watch more videos like MKV, AVI, MPG, VOB, TiVo on Surface RT or Pro, you need to reformat these video files first. You can try this professional Microsoft Surface Video Converter to batch convert videos in various formats up to 1080p to Surface playable format (e.g. MP4). - Don't put copy-protected contents onto the Surface Tablets. Movies purchased or downloaded from online (e.g. iTunes, BBC iPlayer) are restricted to specific computers and devices only. Unfortunately the Microsoft Tablets have not got a license to play DRM contents which means Surface RT or Pro is not granted to play DRM-protected videos. To get the device playing these movie purchases, get yourself a DRM removal tool first (e.g. ChewTune). 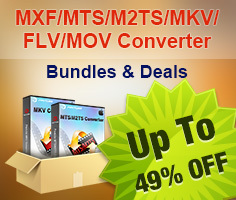 - Compress/convert your HD videos when necessary. By necessary I mean when the Microsoft Tablet pops up an error message saying unsupported file or plays video in slow motion. - Intention to transfer Blu-ray, DVD movies, personal HD video files to Microsoft Surface. You'd better get the best all-in-one video converter tool Video Converter Ultimate to have fastest and most effective conversion. How can I Play Flash Video (FLV, F4V) on Kindle Fire HD? How to Play VOB on Kindle Fire without any Hassle ? How to Convert MPG to MKV Easily? How to Convert MPG to AVI Easily?